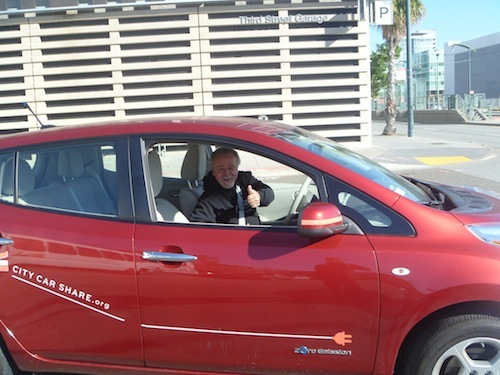 From the perspective of an average American car buyer the benefits and drawbacks of buying A Nissan Leaf electric car must be carefully considered. Range Anxiety is high on the list of things to ponder before making the plunge. Those of us deeply steeped in green car culture see the Leaf as a mainstay of efficient vehicle technology, an obvious choice for those who want to go green in their vehicle choice. A bit of History about the Nissan Leaf. 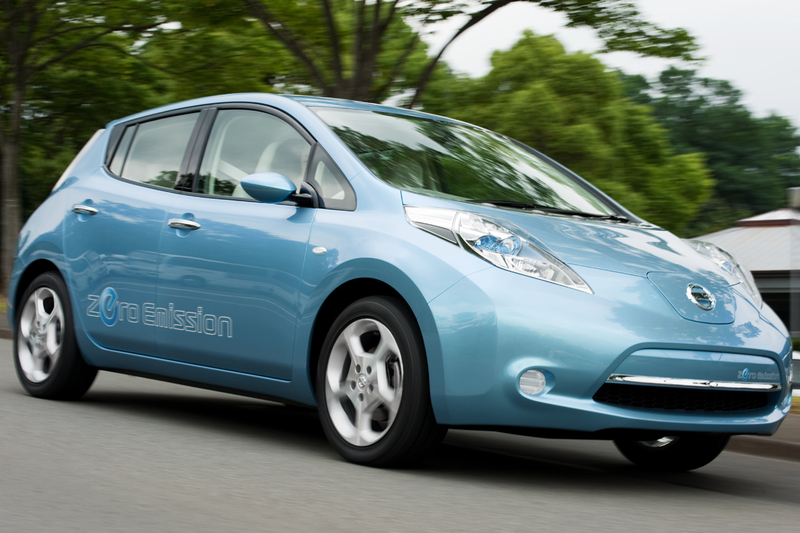 Nissan gave industry insiders an oportunity to test drive the Leaf protype, the mule. The mule was a Nissan cube fitted with a Leaf preproduction drivetrain. The batteries, motor and steering gear to be used in the Leaf were installed neatly into the confines of a highly modified cube chassis. The finished mule was trucked to a few key locations to be shown and test driven. 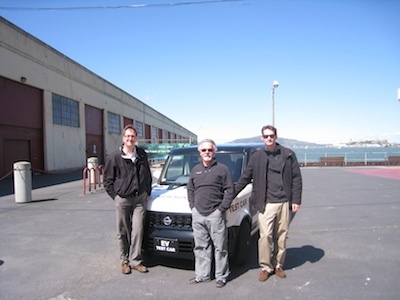 I slipped behind the wheel of the mule and cruised around a closed circuit inside the grounds of Fort Mason in San Francisco in April of 09′. The drive experience was quiet and smooth. The gauges and controlls all functioned. This was a first rate Nissan factory engineer made protoype with full funtionality. The car was quick and silent. The low end torque was impressive. The agressive regen also left an impression. The cube mule felt well planted and evenly weighted. It did not dive on braking or lift under heavy acceleration. Looking back that vehicle was probably built using high quality struts and springs not basic economy car parts. The electric propulsion system was probably tweaked for performance with settings that sacrificed battery life in favor of high performance. 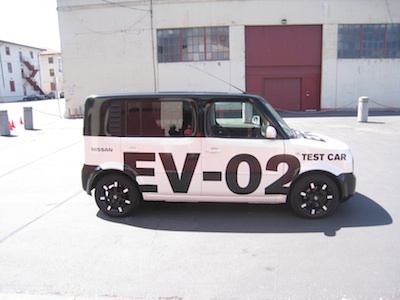 I left the test area with confidence that the Nissan team had the technology and ability to create a lithium battery powered four seater Electric Vehicle. 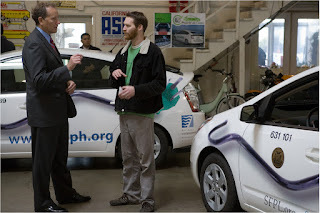 Fast forward a few years and the finished Leaf is here to drive and discuss. My first drive of the current production Leaf was more of a study of the interior gauges and controls than anything. The dash is just dumbfounding until the wonder and amazement fade giving way to a solid impression of how this vehicle handles regular driving situations. First lets review the reality of driving this vehicle. The Leaf is of course an electric car but lets leave the electric vs gasoline argument for later and accept the following premise…. 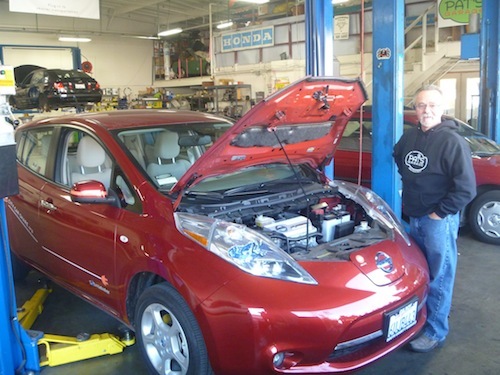 The Leaf can and will do anything a basic 4 door economy car will do except to drive 250 miles without stopping. The reality of driving a four door economy car for most Americans is driving from home to work and back while you play music, talk on the phone, drink coffee, sit in traffic etc. The Leaf drives and feels like a Toyota Prius clone. The driver is imersed in a micro suede and plastic infotainment world while driving in a state mostly insulated from road feel. The suspesion is soft, the steering wheel turns easily. The shift lever is not connected to a cable but is more of a joystick. This is a proven design when it comes to driving with minimal effort and paying little attention to the driving experience. The emphasis is placed on passing the time. The maximum number of easily accessable entertainment features for the price are available. Blue tooth phone, usb ipod jack, steering wheel audio controls are standard, nav and XM radio are extra. It is quite convenient to flick the shifter into ”D” , turn on your favorite music and hit the road. The parking brake automatically releases and the car accelerates smoothly and gives a pleasing electric whine. The brakes are very Japanese economy car like – acceptably powerful without the German car bite. Acceleration and vehicle speed are also acceptable – the car goes as fast as you would need to go in any law abiding driving situation . The suspension is similar to a Prius over bumps and rail road tracks the car is confident and relatively quiet. The nose of the car does lift a bit under full acceleration, maybe the Nissan engineers had trouble setting up the suspension for such an evenly balanced car without overspending. Inspecting the undercarriage of the Leaf does reveal some incredibly cheap looking control arms and ball joints. 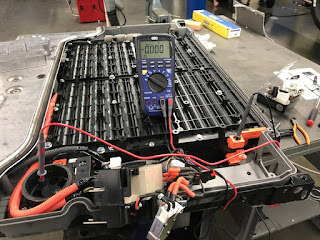 They had to pay for that giant battery somehow and they probably determined that very few Leaf drivers would expect the car to handle high speed maneuvers like a sports car. 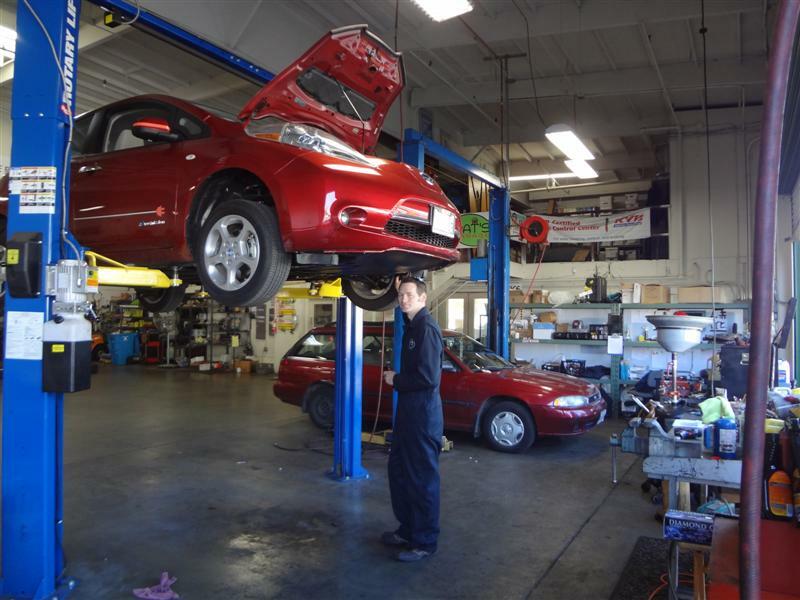 In fact the cheap suspension is par for the course on Japanese economy cars Prius included. Outwardly the Leaf has more eco cred than a Prius, a more futuristic dashboard, and more access to special lane privileges. Driving a Leaf makes a statement about the owner’s beliefs, a desire to aide the environment and reduce personal oil consumption. Driving a Prius has grown past a singular statment and moved into anything and everything from saving the environment to opperating a taxi fleet. 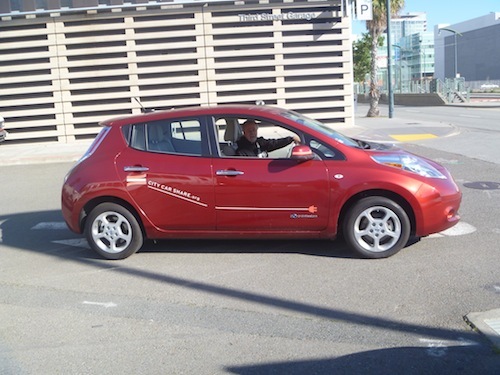 The Leaf remains a clear statement and a pure EV. The Leaf like many Nissan products misses the mark by a very fine margin. This is an excellent vehicle given the confines of making an EV for under $40k. Currently the only other EV in this price range is Mitsubishi iMiev (Chevy Volt is a PHEV not EV) Given the choices at hand the Nissan Leaf is a great car. I just wonder if Toyota, Honda and Ford will hit the scene with an EV that will just nail it leaving the Leaf to look like the ugly step child. I will be eager to Drive the Fit EV , IQ EV and Focus EV and answer that question.